Sberbank, VTB and Vnesheconombank have announced that they are contesting sanctions imposed against them by the EU. Lawyers point out that in order to have the sanctions lifted from them, the state banks will have to prove that they are not responsible for the actions of their main owner. Three Russian major state-owned institutions – Sberbank, VTB and Vnesheconombank – have announced that they have filed lawsuits with an EU court to contest sanctions the European Union imposed on them in late July. The first to announce its lawsuit to cancel the EU sanctions against it was Sberbank, which made an announcement on Oct. 24. 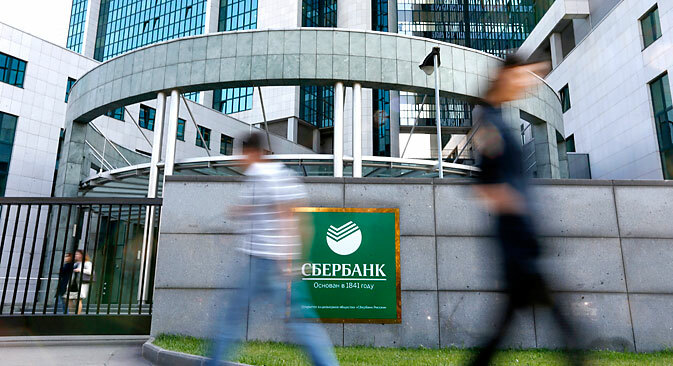 “Since the case is to be heard by an EU court and in line with the usual practice for this type of cases, the bank will not be commenting on its lawsuit until the matter is resolved by the court,” a statement issued by Sberbank said. Similar statements were later released by VTB and VEB. None of the banks have disclosed who will be representing them in court. This means that three of the five state-owned Russian banks affected by the sanctions that were imposed in late July this year have now followed Russian oil giant Rosneft, which filed a lawsuit with the European Court two weeks earlier. Rosselkhozbank and Gazprombank have refused to comment on whether they may be seeking to have sanctions against them removed in court too, though according to a Kommersant source close to one of the plaintiffs, the deadline has already elapsed. “There are certain rules for contesting EU sanctions, which – among other things – prescribe the deadline for filing suits like these. Oct. 24 was the last day when it could have been done,” said the source. The Russian financial institutions were banned access to raising finance (in any form) on the European market for a term of, at first, over 90 days and then, as part of tougher sanctions, of over 30 days. The sanctions were introduced for a period of one year with an option of revising them in three months’ time. The EU could have reconsidered its decision on Oct. 24 but it left it unchanged. The situation that the Russian banks have found themselves in has one peculiarity - the wording of the sanctions does not put the blame directly on the banks. Thus, the EU does not directly blame the Russian banks for the actions of the Russian government in relation to Ukraine but sees their indirect guilt in the opportunity to support those actions. Lawyers point out that under these circumstances, the Russian state-owned banks will first of all have to prove that they have nothing to do with events in Ukraine. “Despite the fact that all three banks are in one way or another controlled by the state, they are not responsible for decisions taken by their owner, i.e. the Russian state,” says Yury Nikolayev, chairman of the Moscow law firm Nikolayev and Partners. If the court is governed by the norms of the law rather than politics, they have a chance of having the sanctions lifted, he adds. However, even if the European court sides with the Russian banks, one should not expect a quick decision. According to Pleshakov, Ushkalov and Partners managing partner Vladimir Pleshakov, hearings like these last at least six months at best. “If we are to compare the chances of Sberbank, VTB and VEB of winning the case, Sberbank has an additional advantage in that, unlike VTB and VEB, it is not directly owned by the state, since its controlling shareholder is Bank of Russia, which is far removed from taking political decisions,” says Pleshakov. Read more: How critical are the new EU and U.S. sanctions for Russia?